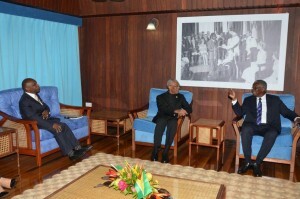 President David Granger (centre) chatting with Prime Minister of Barbados, Freunde Stuart at the Ministry of the Presidency. Also present was Foreign Affairs Minister, 2nd Vice President, Car Greenidge. Barbados’ Prime Minister, Freundel Jerome Stuart has topped Guyana’s list of National Awardees that was announced to coincide with the South American country’s 50th Independence Anniversary. The Order of Roraima is Guyana’s second highest national award after the Order of Excellence. President David Granger, in his capacity as Commander-in-Chief of the Armed Forces and Chancellor of the Orders of Guyana also awarded several other persons, who are linked directly and indirectly to the People’s National Congress Reform (PNCR), the largest constituent in the coalition-led administration were named as national awardees. Those directly linked to the PNCR are its former leader, Robert Corbin; former government minister, Jeffrey Thomas and a number of current and past staff members at that party’s headquarters. Among the thousands of attendees at the Flag Raising Ceremony held at D’Urban Park were Commonwealth Secretary General, Baroness Patricia Scotland, United States’ Deputy Assistant Secretary of State for Western Hemisphere Affairs, Juan Sebastian Gonzalez, Opposition Leader Bharrat Jagdeo and former President, Samuel Hinds. “Regrettably on arrival at the VIP area tonight there were no seats set aside for the Opposition MPs, except for the two Former Presidents, Dr. Jagdeo and Mr. Sam Hinds and two other MPs. The majority of the MPs were left standing. Appeals were made to Minister Henry and Attorney-General Basil Williams but to no avail. However, in the interim dozens of people were escorted to and seated in the VIP area. After standing for over half-of-an-hour in the passage way and no seats were made available, the Leader of the Opposition, Former President Hinds, accompanied by the MPs and their spouses departed. The humiliation of standing in the passage way while other people were being seated was deliberately designed to humiliate and embarrass the PPP/C parliamentary opposition,” stated the PPP.